Spotlight Series: Miss Alaska Pumps Up! At PumpUp we’re proud to have so many incredible members. Recently we found out that Jessica F., also known as Miss Alaska, is using PumpUp to train for the Miss United States Pageant! Q: So, what got you into participating in pageants? A: I got into pageants to help fund my college education. It started with Miss America, until I became too old to participate. I won a local title, then went to state where I was 1st runner up. As a result, I received the title of Miss Alaska sweetheart. This gave me 2 full years paid for with school! Q: How does it feel to be Miss Alaska? That’s a big deal! A: It feels awesome! Though it’s definitely a huge weight on one’s shoulders; you need to be careful where you go in town and who you associate with to maintain a good image as Miss Alaska. It’s a very honorable position and you only have for the title for 1 year, so it’s important to make the most of it! Being an Alaska native, it’s huge for the culture, community, and the state itself! Q: How do you use PumpUp to train for Miss United States? A: I’ve been using PumpUp at home and at night on top of my time at the gym doing a special Miss Alaska routine. I especially love it for core and conditioning circuits at home, I love how it uses the equipment I have available at home. I even pick and choose exercises I discover from PumpUp that I use for my personal training clients! Q: What is your favorite thing about PumpUp? A: I love the diversity of exercises. Even if you’re just trying to do a core circuit you’re always learning something new! Even as a trainer, I’ve learnt a ton of new exercises from using PumpUp which is awesome! Q: What’s your favorite part of the journey toward the big Miss United States pageant? A: Other than just being able to be a mentor for the community, it’s really being the best representation of the state of Alaska. Being a titleholder is not just about being a role model. It’s about setting a standard of what young people are expected to do, being an active member of the community, and doing something that is meaningful every single day! Q: What is the toughest part of your journey toward the pageant? A: Staying in shape with all the great food at all the fundraisers! Also making time to be everywhere at once! I always have many appearances to attend, and its a challenge to manage my schedule. Q: You live a busy but very healthy lifestyle. Awesome work! Do you have healthy living tips for PumpUp members? A: Definitely. My biggest tip – don’t treat exercise as a diet. Once you meet your goal, don’t just end there. It really needs to be a lifestyle. You need to incorporate it into everything you do. Everyone is busy, family, kids, but it’s so important to make some time for yourself, take care of your own well being. Stay active. You just gotta stick to it! We had a blast talking with Miss Alaska! 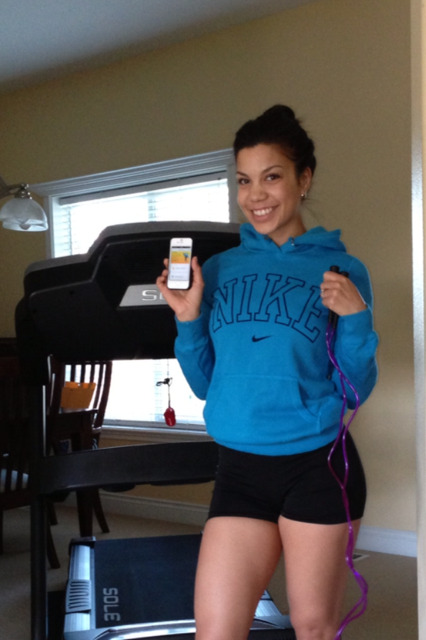 We’re excited Jessica is loving PumpUp and using our app to train for the Miss United States pageant. Best of luck, Jessica! Make us proud! P.S. Don’t forget to download PumpUp to start living a more active and healthy life, just like Miss Alaska!